As you may have noticed, I changed a section on the left side bar. It contains the list of clothes I am looking for to help me complete Squirt’s catalog. If you have any of the items, please send me a message or an email! Thanks. The list used to be a lot longer, but thanks to Vella I was able to catalog a ton of clothes! Thanks for your help, Vella! 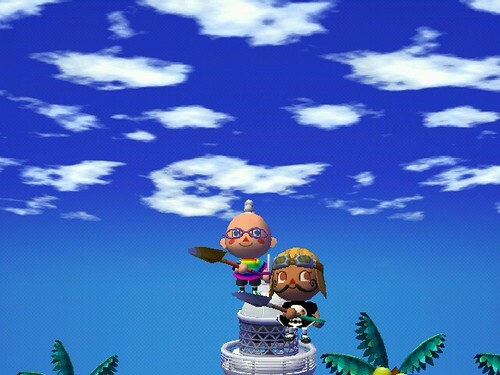 So of course I had to put on the most ridiculous outfit possible while we had a photo-op on top of the Lighthouse. Squirt and Vella... both looking strange. It is officially mid-September. This means that two more fish are available to be caught, the Salmon and the King Salmon. 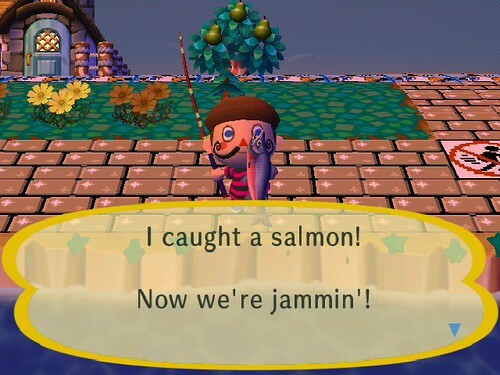 Squirt was lucky enough to have caught a salmon back in Cousin Vella’s town a while ago. So the elusive King Salmon was the last thing I needed to catch to complete the Fish Index, as well as the Museum. Before I could get to any of that, however, I was accosted by Pete infront of the house. He said he had a letter from Nintendo. 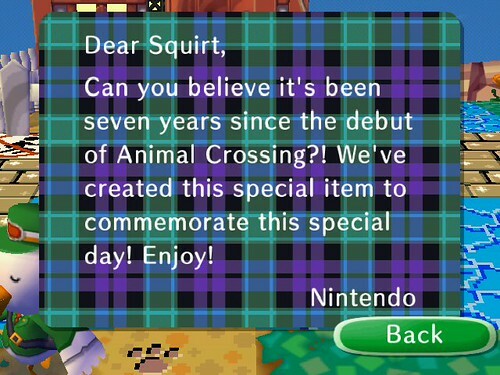 Apparently it’s been seven years since the first Animal Crossing was released, so Nintendo was sending us DLC! Could they have chosen uglier stationery? I thought the letter was a little misleading. They didn’t exactly create the GameCube dresser just for this occasion, considering that my European friends received this item last month. I’m not sure what the EU DLC letter said when they received it though, so maybe I’m wrong. But anyway, I accepted my extra dresser and sold it for a decent amount. My search for the King Salmon began. I had read that the salmon migrate from the ocean, and swim upstream through the rivers. So I started out by the ‘river mouth’ which is the area by my lighthouse. Nothing was there. At first I thought maybe it was still too early to catch these fish. But I started walking up the river to see what I could find. Lo and behold, the salmon were biting! I walked up the river, all the way up to the northern waterfall, and I must have caught at least 15 salmon. Where was the mighty KING SALMON?? I was becoming desperate. I even saw a Giant Petaltail flitter past me as I searched the river in vain. Nothing would distract me! 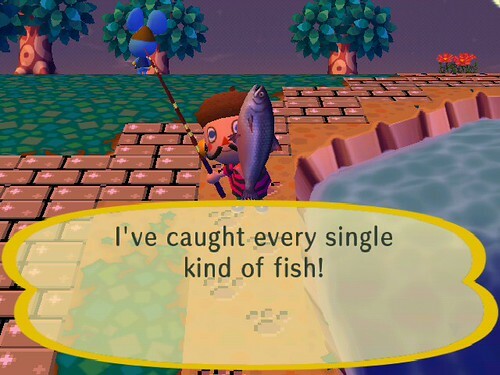 I didn’t even know what size shadow to look for, although I did remember that in AC:WW it was a pretty big fish. I was standing by the lake that’s in the middle of the river – probably the worst fishing spot ever. A huge fish was swimming along. So I cast my line and waited as patiently as I could for the bite. 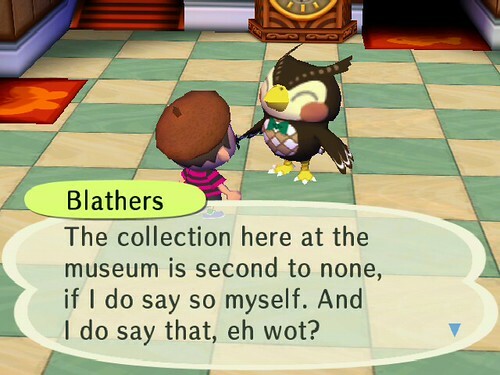 You know where my next stop was – THE MUSEUM! We are now a top-flight museum of the highest order! I am simple awash with pride. Awash, I say! Ah, of course, it is through the hard work of many that we have reached this lofty peak. Quite right! Congratulations to one and all on this glorious accomplishment! 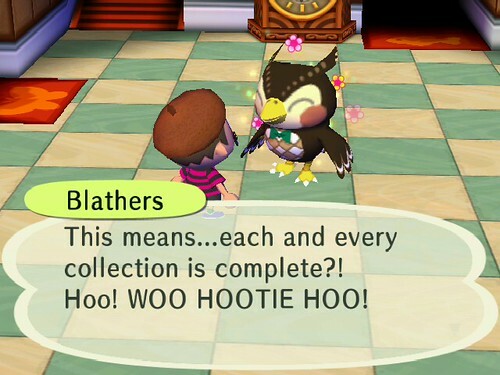 Hoo! OK, so Squirt probably won’t be completing the Gulliver set (legitimately, anyway) before retirement. But I’m not going to worry about that. There’s also the matter of collecting all the different colored feathers from donating gross sums of money to the Town Hall Fund. Those are long term things that I can always work on in random intervals. Deb will probably be taking over by the start of December. When that time comes, Squirt will have a retirement party, and then I’ll post Deb’s friend code here on the site. Sound good folks? Congrats to the museum completion! I still have a long way to to. 9 bugs, 3 fishes to finish. I just sent you email and would like to bring 3 flowers to your town some time at your convenience this month. My town’s charm this month is to find a clover in hang, no luck so far.